On the workbench a 1968 Gibson 335. A phone call from a distraught Stage Tech. This guitar was slowly losing its headstock! The guitar belongs to Richard Oakes, the guitarist with Suede. 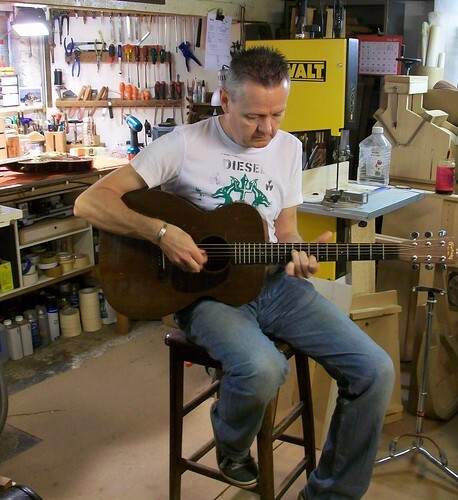 This is his beloved guitar which has had the headstock broken and repaired once before. The Stage Tech had resorted to binding the headstock with Gaffer Tape in the hope that it would last a little longer until the end of the band’s tour. 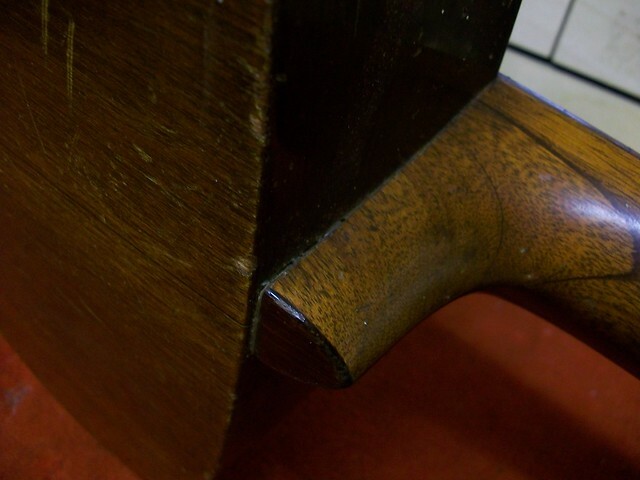 Once on the bench it is clear that the repair is substandard and slowly coming undone. All it takes is a little tug and the whole repair comes apart. This particular break is a bad one, it’s a shear break. The headstock has broken from the neck at 90° to the grain of the wood. This makes for a challenging repair confounded by the fact that it has been repaired once before. All remnants of the old glue must be removed before a new join can be made. Fortunately there is no damage to the end of the truss-rod. A shear break makes for a difficult repair because it is impossible to rejoin and glue the end grain of a section of wood to another end grain. Reinforcement strips will need to be inserted. It is important that the any repair work should be discreet and invisible. Fortunately the head veneer is still in one piece and undamaged. The break has occurred just underneath the top nut. So it is decided that the head veneer should be removed and replaced once the repair and inserts have be added. 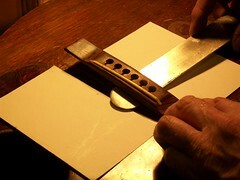 The head veneer is clamped under a piece of perspex to keep it flat until needed later on. 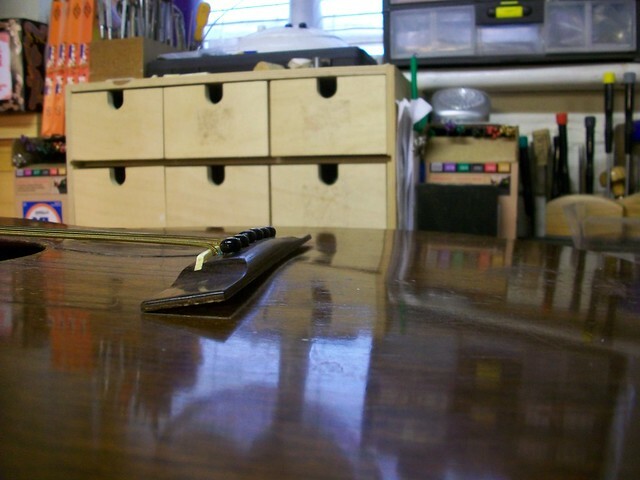 The idea is to join/re-glue the neck to the headstock (as best as). And once this is done reinforcing inserts can be added. 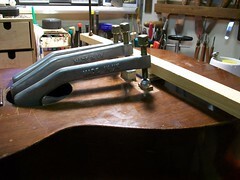 A jig is made up to hold the guitar and headstock in place whilst the glue sets. 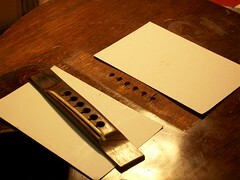 Once rejoined, the neck and head are routed to except the inserts. Brazilian Mahogany and ebony inserts are made up and glued in oversized to be trimmed down to shape once dry. And the back of the neck/headstock is refinished to disguise the work. A few other jobs around the guitar are carried out i.e. fret work and a new bone nut. All in all a successful repair. I believe the guitar will now only be used for studio work. It is regarded too highly for the rigours of touring. 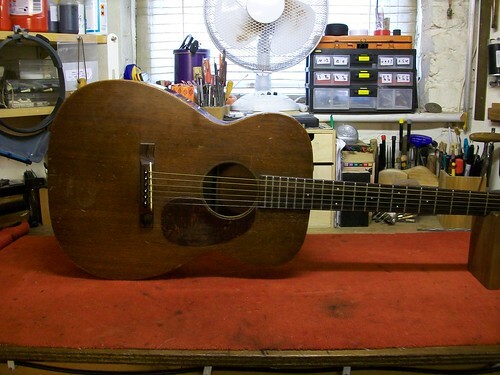 This lovely old Guild on the workbench is in need on a bit of TLC. It’s an M20 made in 1961. This model has been called the Nick Drake model because of the association with him during the 70s. This particular guitar belongs to Seasick Steve. You may have seen him on the Jules Holland show or heard him on the Chris Evans Breakfast Show on Radio 2. The guitar has got a few problems. The soundboard has a distortion at the edge of the sound-hole. Frets 1-5 are worn and there are some intonation issues. 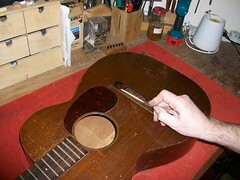 Seasick Steve is in London for a limited time so the guitar has to be repaired and turned around very quickly. Close inspection reveals a loose X brace on the bass side. This is causing the distortion in the soundboard at the sound-hole. The loose brace is glued, clamped up left to dry overnight. 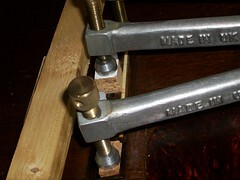 The intonation issues is caused by a badly fitting nut. Also it is not intonated correctly over the bridge saddle. These and discarded and a new bone nut and saddle are made and fitted. 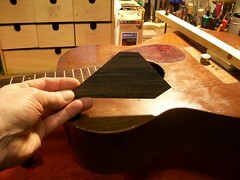 A light redress of the frets is enough to take out the wear in the frets. Soon the guitar is playing smoothly and sounding great. Seasick Steve thinks so as well. 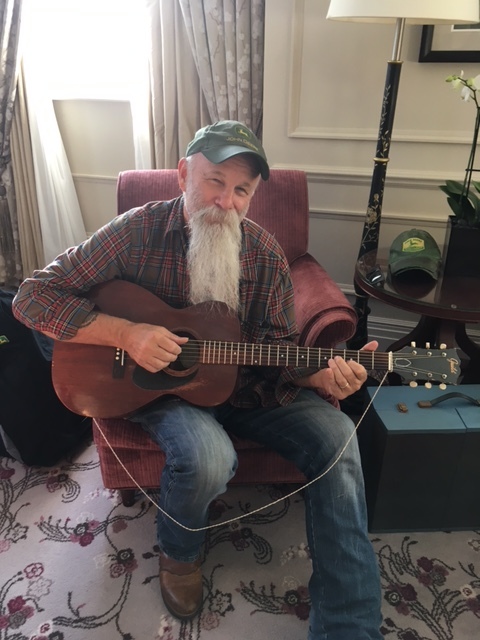 Seasick Steve tries out his repaired M20 in his hotel room. 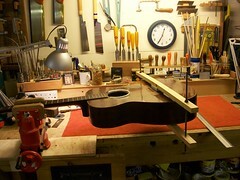 Here’s an unusual guitar on the workbench. A Stevens by Fender made by Michael Stevens. This beauty has taken a tumble and the inevitable has happened, a broken headstock. As evident from the serial number this guitar was one of the first few in the run. I can’t be exact as to where this guitar was made but the decal suggests it was out of the Fender Custom Shop. The electrics cavity-cover bears two signatures and a date which adds to the intrigue. 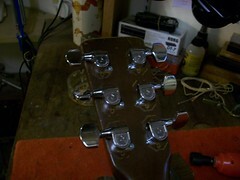 It is decided that an invisible headstock repair should be made. This complicates matters as spraying a headstock with a coloured lacquer, so as to disguise the repair, will obliterate the decal. And the decal is essential to authenticate the instrument. It will be impossible to save the existing decal as the finish on the back of the headstock will need to be scraped back to the Mahogany. After considered thought it is decided that new decals should be designed and made up. 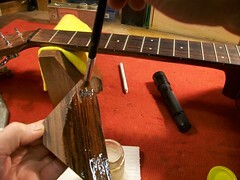 Firstly the damage to the headstock is repaired, hot hide-glue is used for this. The break is clean with a large gluing area. 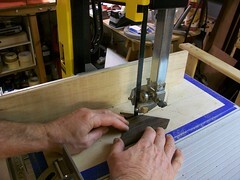 The neck and headstock are stripped down using a simple cabinet scraper. This ensures that the finish is removed in a controlled and careful manner. The guitar body, fingerboard, edge-binding and headstock face are masked off and the guitar prepped for the spray booth. Layer upon layer of this mix is sprayed onto the neck to eventually fill the grain and to bring the finish up above the surface. The water-slide decals are soaked, applied to the surface and left to dry. 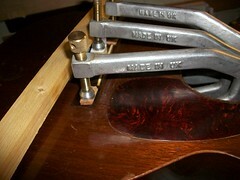 The surface of the neck and headstock are burnished and polished and the tuners reinstated. All in all a good result and another quality guitar back in action. This lovely old Gibson L0 was made in the 1930s. It was taken in by this workshop some years ago for an extensive rebuild. It’s had a hard life and had undergone some very strange repairs over the years. 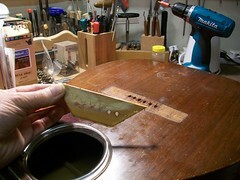 The majority of the internal struts within the soundboard were loose and in a previous and mistaken repair attempt to stabilise the struts, Epoxy Resin had been smeared on the entire underside of the soundboard. Also wooden clothes pegs were glued here and there as a misguided attempt to strengthen various parts of the soundboard. The bridge was missing. 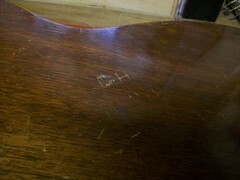 There were several splits and cracks on the soundboard as well as a distorted area around the footprint of the bridge. All in all the whole instrument was in a sorry state and on the verge of being discarded. Fortunately its neck, fingerboard and frets were in good order and the guitar was owned by someone who could see the potential in this old guitar. After months of intensive restoration the guitar was finally restored and shipped off to its owner in the Midlands. Much to his distress on arriving it was revealed that the guitar had been mishandled by the carrier during transit. Unfortunately the guitar had suffered catastrophic damage to its ribs. 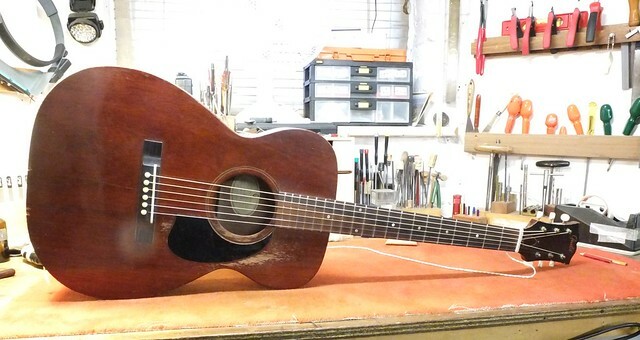 Fortunately insurance had been taken out prior to the guitar being shipped and after much haggling with the carrier the guitar was returned to the workshop and work commenced on its second restoration. The split was extensive and extended from the waist on one side to the waist on the other. 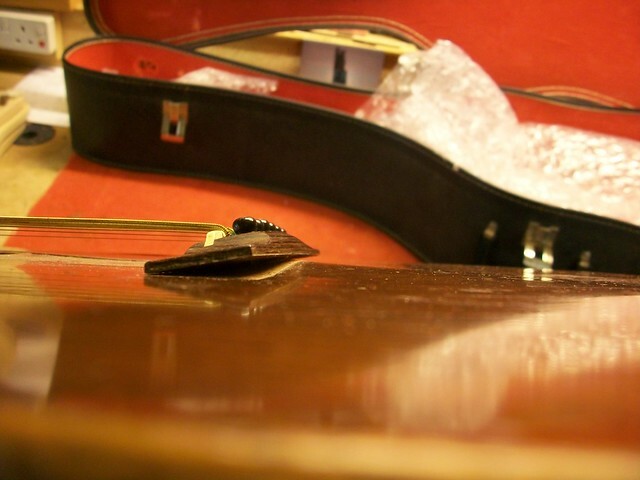 The split had occurred when the guitar (in its case and packaging) was drop upright on its end. This caused a split that ran along the grain of the rib. The broken halves of the split will need realigning and gluing back together. Also the area along the length of the split will need to be reinforced. 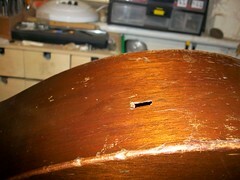 Small holes are drilled through the guitar rib for the string to pass through. Once tightened and the reinforcing strips are held in place. 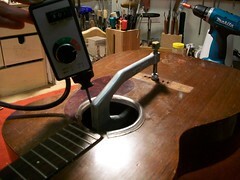 With the glue dried the sides were lightly sanded, re-finished with a Shellac based lacquer and matted down. I’m happy to report that the repair went very well and the guitar is now back in action again. No more National carriers though, this one is hand delivery only.